If you are committed to co-sleeping then you have a couple of options – pray it stays winter all year round so cosiness is welcome, upgrade to a king-sized bed so you can all fit, or invest in a game-changing idea like a bedside sleeper. Three years ago, Just for Baby introduced Australia’s first bedside sleeper and they continue to revolutionise this relatively new market with Australia’s first two-level bedside sleeper so your baby can stay by your side for up to two years (or 89 cm in height). The Arms Reach Ideal Co-Sleeper is the result of thousands of requests and years of design experience and it is finally hitting the Australian market this August. 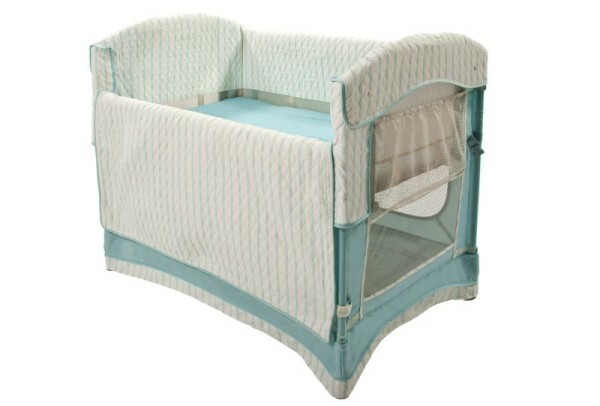 This game-changing bedside sleeper is versatile for long-term use, can easily be folded down, used as a freestanding bassinet or cot when the co-sleeping side is up and it is completely portable. It attaches securely to the adult bed under the top mattress and offers a leg extension kit to ensure it fits the height of your particular bed. Parents who love the idea of co-sleeping but are worried about the safety aspects of it will love the fact that the Arms Reach Ideal Co-Sleeper has breathable mesh on all four sides and a ventilated floor for ultimate safety and breathability while remaining in close proximity for easy night time feeds and bonding. Complete with a water resistant mattress, one fitted sheet and a carry bag for travelling, the Arms Reach Ideal Co-Sleeper comes with everything you need to get started. The Arms Reach Ideal Co-Sleeper is available in two colours, French blue or Cocoa natural and can be bought exclusively from Just for Baby for $399. Free shipping is available throughout Australia and they also ship to New Zealand, Asia and the Pacific.